Germany should appoint an anti-Semitism commissioner to counter growing hate speech against Jews and Israel from both its home-grown far right and the immigrant community, the interior minister said Sunday. Thomas de Maiziere spoke days after protesters in Berlin burnt Israeli flags to protest the US decision to recognise Jerusalem as the Israeli capital. "Anti-Semitism must never again take hold in Germany," he said, pointing to a rise of "derogatory remarks, inappropriate jokes and discriminatory behaviour against our Jewish citizens". He condemned the recent flag-burnings as "the symbolic destruction of a country's right to exist", while Defence Minister Ursula von der Leyen also said such expressions of hate were "unbearable". 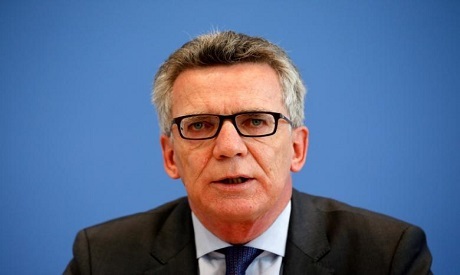 De Maiziere said when Germany has a new government -- which Chancellor Angela Merkel's conservatives and the centre-left Social Democrats are now discussing -- it should appoint an anti-Semitism commissioner. Merkel's spokesman Steffen Seibert said last week that, although Berlin opposed the move by US President Donald Trump, it strongly condemned protests where "hatred" of Israel and Jews was expressed. Justice Minister Heiko Maas demanded that lessons on the Holocaust be included in integration courses that teach German language and civics to asylum seekers and immigrants. He wrote on Spiegel Online that many "come from countries where powerful elites intentionally fuel hatred of Jews and Israel, and where anti-Semitism is practiced almost as a matter of course". Maas said that all immigrants needed to understand that "we fight against the anti-Semitism of the neo-Nazis and we will equally never tolerate an anti-Semitism imported by immigrants".